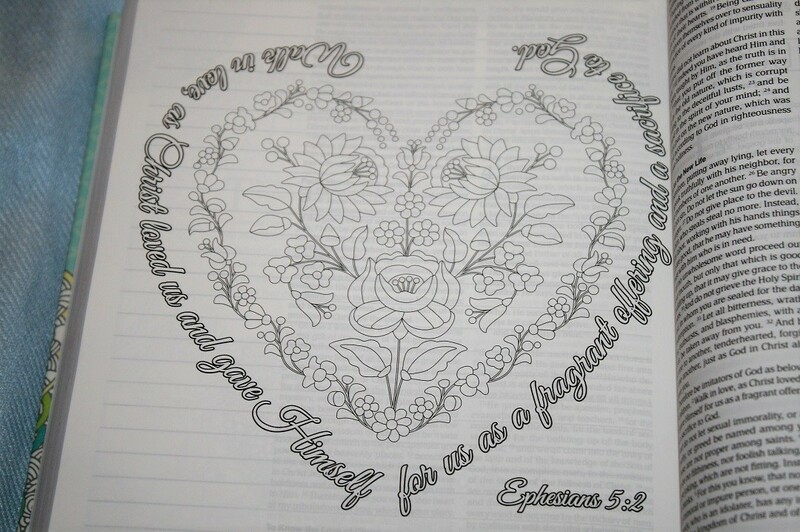 Passio’s first illustrated Bible is the MEV The Promises of God Creative Journaling Bible. 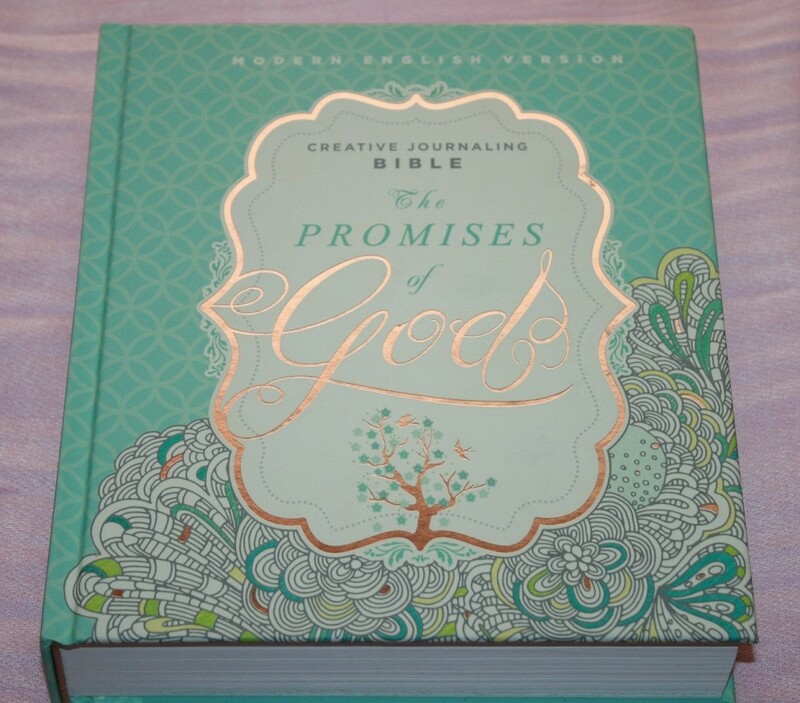 Passio’s creative journaling Bible is an aqua and white with accents of copper hardcover with sewn binding. 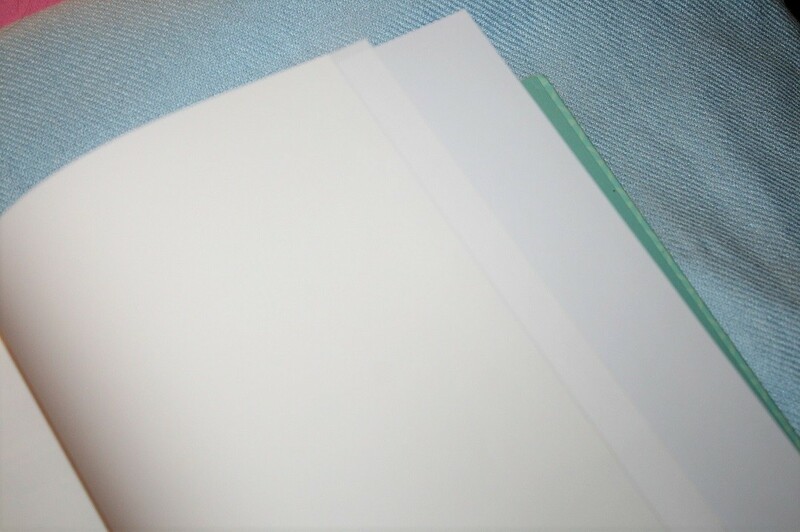 The thick paper liners are a light yellow and white version of the circle and diamond background on the cover. 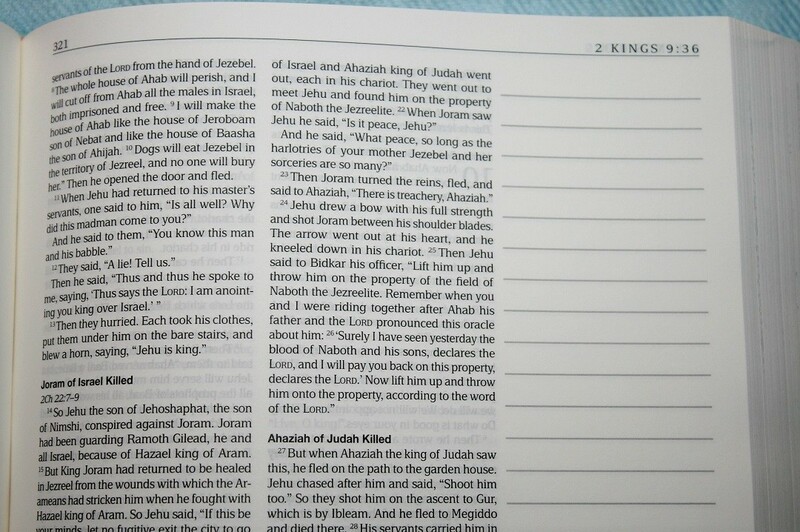 The paper is the 38 (approx) gsm creamy paper that is (almost) the standard in journaling Bibles. 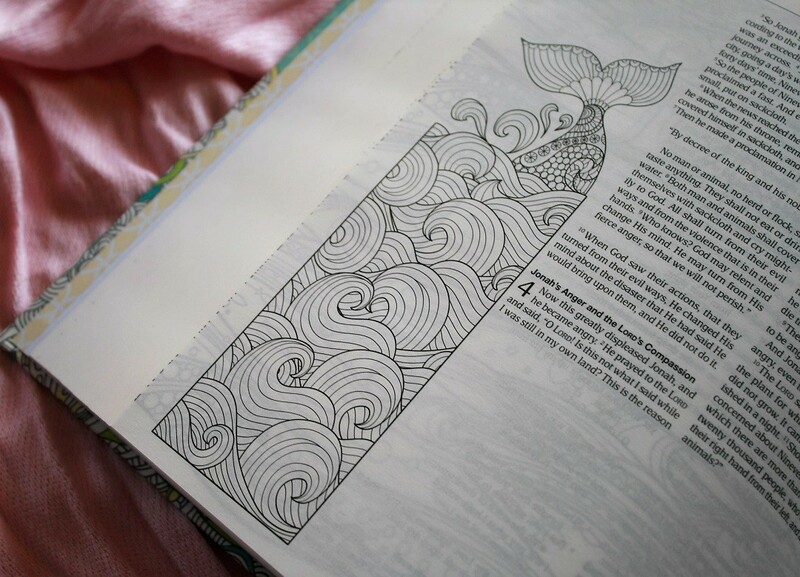 The pages are easy to turn. 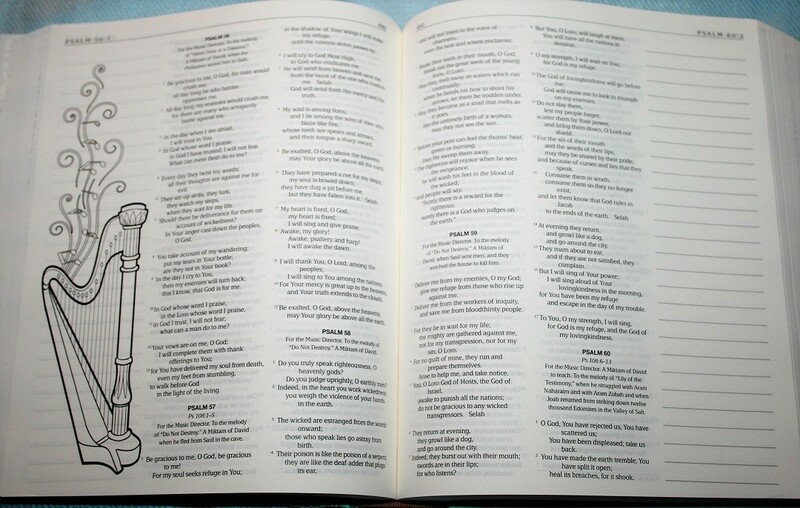 They’ve included 9 blank pages of regular Bible paper in the back. And 1 sheet (2 pages) of slightly thicker blank paper front and back. It is laid out in a double-column paragraph format with poetry set in stanzas. 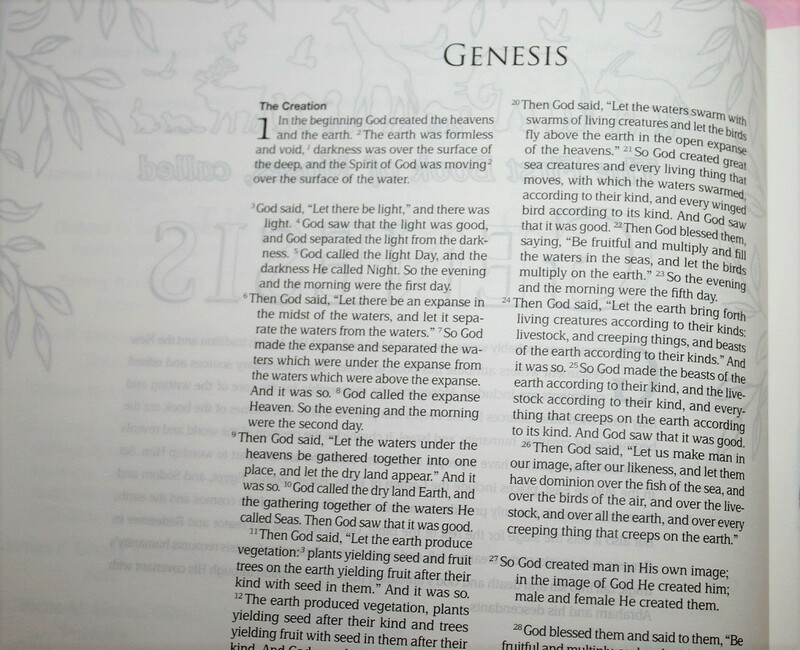 Page numbers are on the upper inner corners while book names and index verses are in the upper outer corner of the page. The 8 point font has a consistent medium darkness for both the black and bright red ink. 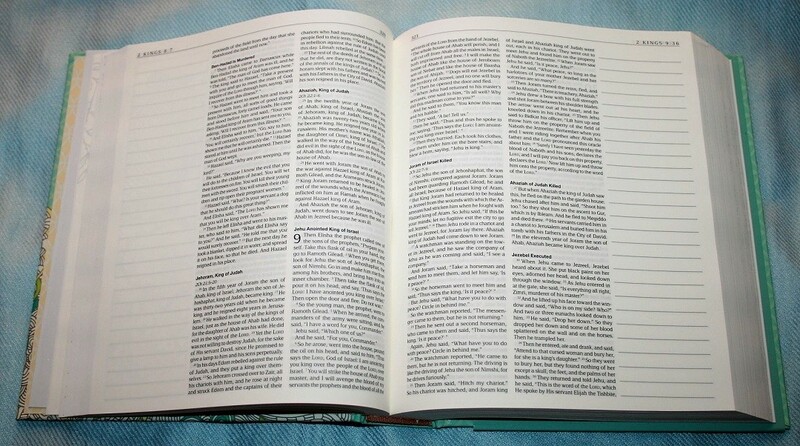 The references for parallel passages are printed directly under the headings in italics. 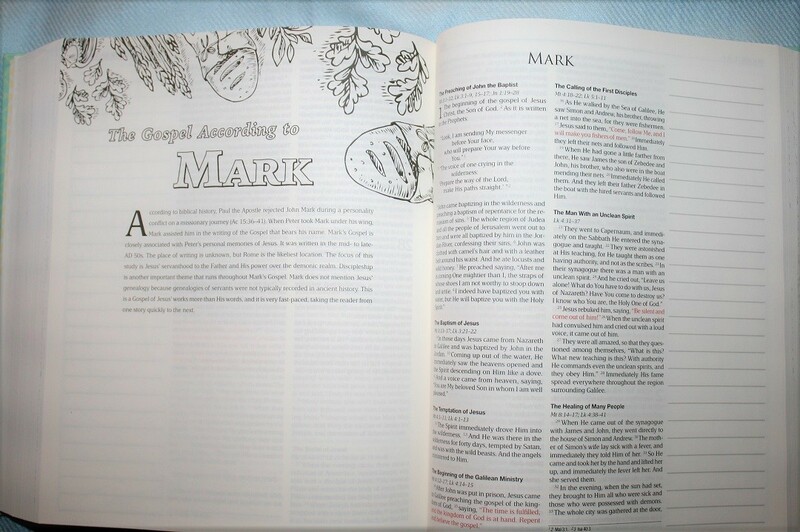 One of the nice (and somewhat unique) features of the MEV The Promises of God Creative Journaling Bible is the combination of lined and unlined margins. 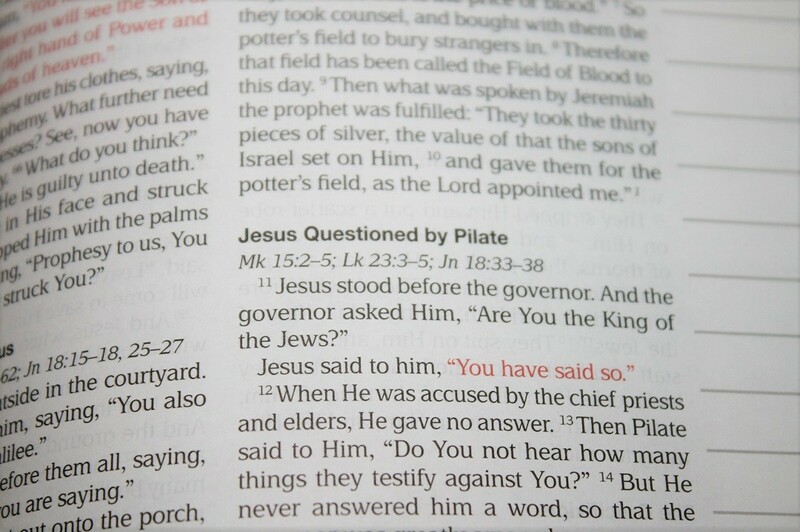 All of the left margins have 27 lines 1/4 of an inch apart. Most right margins are completely blank. You do get enough show through of the lines on the back side of the page to use them as guides for spacing. 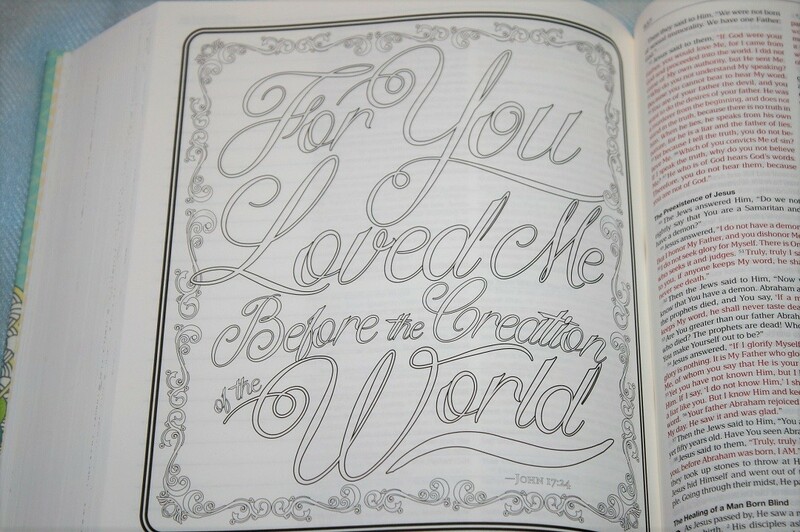 Close to a hundred of the left margins contain line drawings instead of being blank. There are also a handful of full page illustrations. 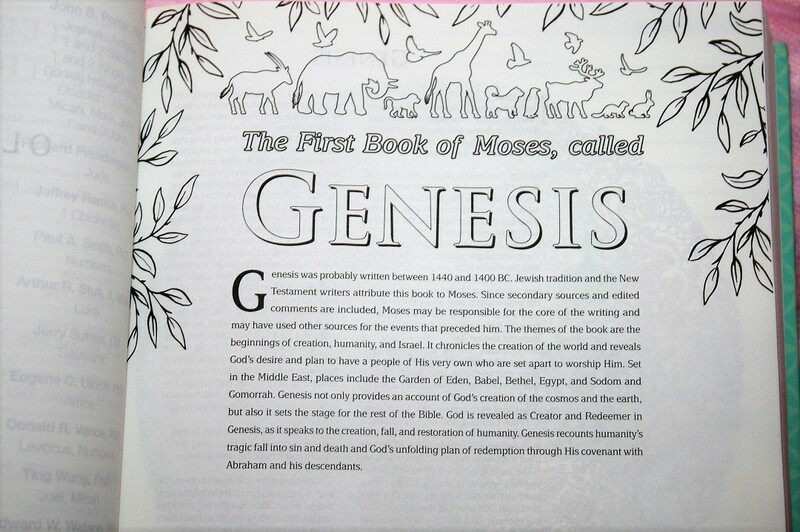 The backs of the full page illustrations are lined instead of containing Biblical text (less cause for worry if something bleeds through). The title pages are not blank on the back and both they and the full page illustrations can be on either the right or left side but the marginal drawings are always on the left. 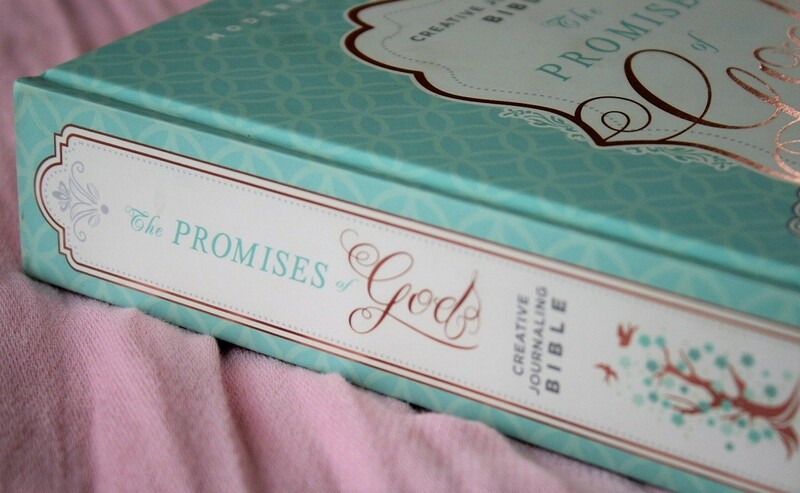 The MEV The Promises of God Creative Journaling Bible is a good addition to the growing collection of illustrated Bibles. 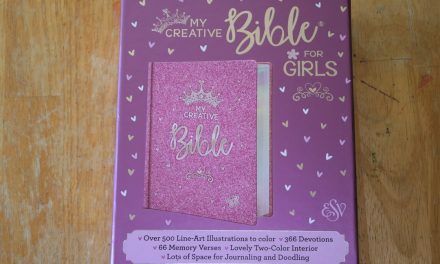 It’s a solid choice for a creative journaling Bible, especially if you’re a fan of the MEV, want to both write and draw in your Bible, or you want more room for your own creativity than pre-drawn artwork. 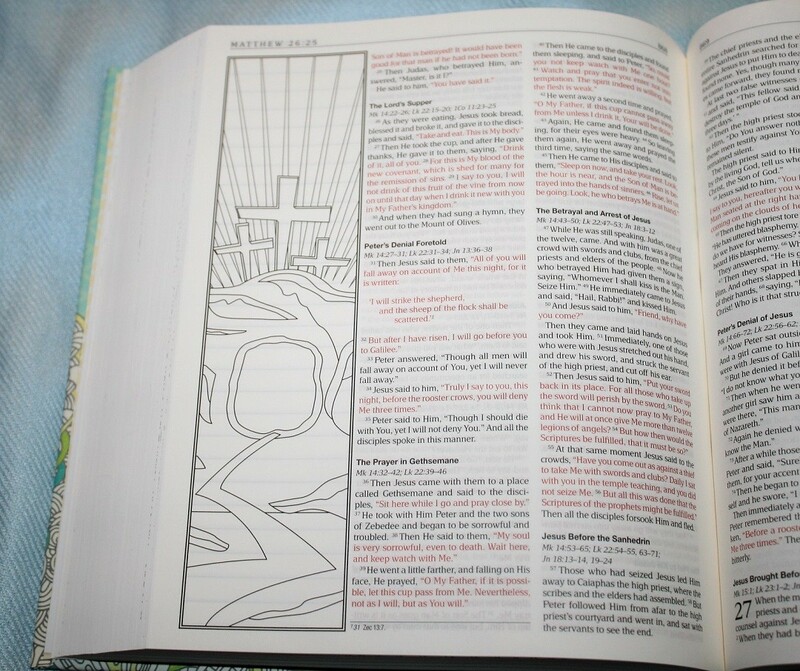 How important is the translation or the words of Christ being in red to you when choosing a Bible? 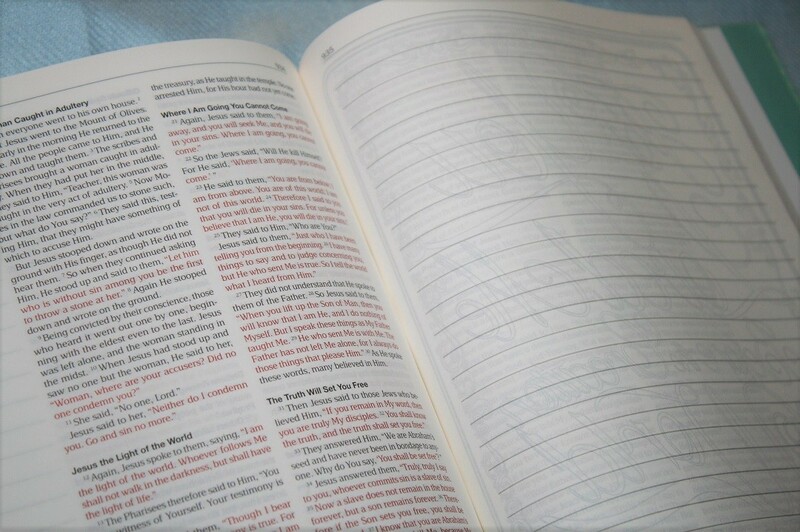 Do you prefer lined or unlined margins in your Bible or do you like this mix of both? Are there any of the other book title pages you’d like to see a picture of? (On Bible Buying Guide’s Pinterest or Facebook pages) Let us know in the comments.